Keeping your aquarium clean is vital when it comes to a successful tank. 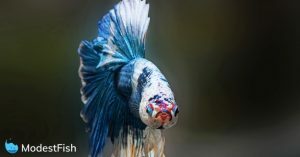 So it’s natural to want a filter with an excellent filtration process – replacing the nasty bacteria with the good bacteria your fish need to stay happy and healthy. Hang on the back (HOB) filters are one of the most popular filters, as they’re easy to install, effective, and need little maintenance. In this article, you’ll discover what you need to know when choosing your HOB filter. And then see reviews for some of the best HOB filters you can buy in 2018. **Before reviewing the individual hang on the back filters, I’d like to talk about what you should know before picking one. Or if you’re just here to see detailed reviews, you can jump straight to it by clicking here. Generally, hang on the back filters are simplistic. They consist of little more than the filter body, intake tube, and the filter media cartridge. And tend to need less maintenance when compared to the other styles of filters available. The filter cartridges act as the medium for the 3-stages of filtration: mechanical, chemical, and biological. Some come with a detachable bio-wheel to promote the growth of friendly bacteria. You should never clean or allow it to dry, this could kill the beneficial bacteria. The older models sometimes come with a detachable motor, whereas newer ones have the motor incorporated. So you don’t have to remove and clean it. Having a cover for the impeller is alway best. It protects against debris that could damage or impede it’s performance. 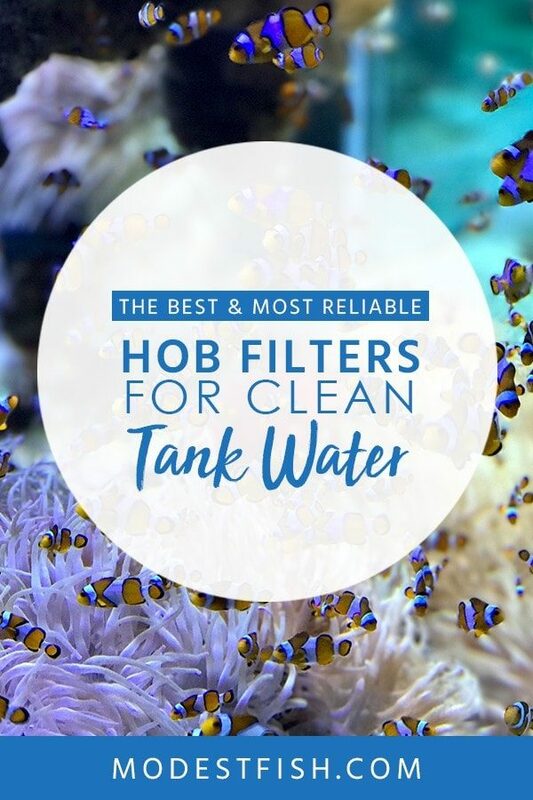 A main feature of the HOB filters is the water spouts. 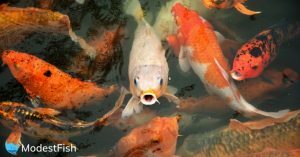 Depending on the size, there may be one or two return spouts that serve the purpose of returning the filter water back into your aquarium. Generally, it’s minimal compared to other styles of filters. You’ll need to replace your media every 3 to 4 weeks, and little else. This can vary depending on the filter you choose. It’s always good to clean your impeller if there’s no safety guard, as debris can get lodged and affect its efficiency. Over time, it’s possible algae may build up on the intake tube and inside the filter. But, the filters themselves tend to be very easy to rinse or scrubbed when necessary. Now you have a much deeper understanding on how to pick HOB filters, you can use the following reviews to help make an informed decision. Available for 20 to 110 gallon tanks. The AquaClear filter uses a CycleGuard multi-stage filtration system. This will provide you with mechanical, chemical, and biological filtration. It’s unique design lets you hold a larger volume of media compared to other filters in this category. You can pack in all the necessary media. The design is great as there’s only one way the water can flow – through the media. The kit comes with media, including Amrid, which is excellent for the removal ammonia. It utilizes both foam and carbon inserts, which remove solid waste, and foster colonies of beneficial bacteria. These are essential for maintaining the nitrogen cycle. 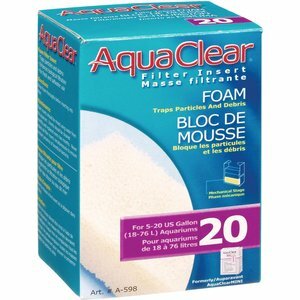 AquaClear has a patented re-filtration system. You can control the flow rate without compromising filtration and save running costs. Reduce the flow by 50% and the filter will process the water multiple times. This lessens the pressure on the impeller, which can lengthen it’s lifespan. The filter runs silently, and it’s easy to clean and maintain. You’re easily able to access the impeller and clear out any debris. Summary: A very popular brand of HOB filters, they’re known for producing highly efficient and reliable filters. Available for 20-70 gallon aquariums, it uses a 3-stage filtering process. It’s two-pump system is highly efficient and tough to match. 100% water to media contact gives your water the best chance to stay crystal clear. But, it’s the bio-wheel that stands out. The fibrous material provides an immense surface area for healthy bacteria to grow. The rotation means there’s plenty of oxygen to keep that good bacteria thriving. This kit includes a Rite-Size filtration cartridge, and it works really well. Providing your mechanical and chemical filtration, it screens out dirt and debris. And removes ordors, disocolotation, and impurities. A cool bonus is that it can act as an alarm for your water level. If for any reason it drops too low, the waterfall transforms from quiet to annoyingly loud. You’ll know very quickly that you need to replace your lost water. Summary: It doesn’t matter if you’re a beginner or experienced hobbyist – it’s got you covered. Featuring a 3-stage filtering process, It’s two-pump system is highly efficient and tough to match at this price. Available for 10 to 70 gallon tanks, it uses an incredible 5-stage filtration process! With a huge surface area, it does a fantastic job clearing out fine debris. The final filtration process is a separate container for your C-Nodes. This does a superb job at removing ammonia and nitrates, and creating an environment for those bacteria you want to thrive. 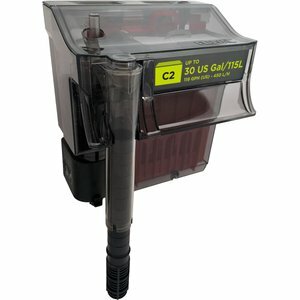 Fluval C Power filters come with their patented re-filtration system. It allows you to control the water flow without compromising efficiency. You can adjust the flow to accommodate fish and plants that don’t enjoy high flow rates. Reduce the flow by 50%, and the water in your filter will re-processed multiple times. Filtering out more impurities. The motor’s durable, very quiet, and your impeller is protected from debris that could damage it. It’s very easy to setup and maintain–you even get a neat indicator which pops up when it’s time to clean. Pro Tip: When you insert your Poly-foam pad, make sure to put the very fine side facing inwards. If you don’t, you’ll restrict the flow and end up with a backup of water. You don’t want that, trust me. Summary: A trusted brand in the aquatic community. 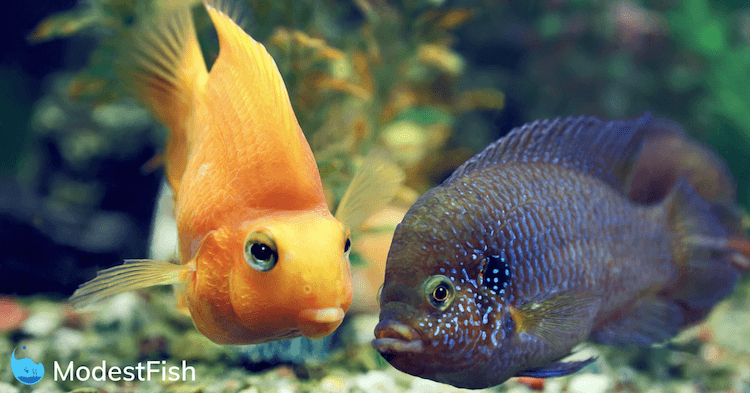 You can always rely on Fluval for high-quality products that come with high-quality results. A high-capacity filter, it’s suitable for tanks up to 80 gallons. When you receive it, it’s very easy to setup: insert your media, hang it on the back, and plug it in! Doesn’t get much easier. What stands out is the two-pump design with dual bio-wheels. It’s outstanding water intake and output makes for an excellent 3-stage filtering process. Pro Tip: When you open the box, there are little white clips are essential for allowing the bio-wheels to spin. Sometimes these can fall out in transit and will be in the bottom of the box. The dual bio-wheels do a solid job of creating all those healthy bacteria we can’t seem to stop talking about. The wheels will slow down over time, but don’t fear. As long as they’re spinning (does not have to be 24/7 spinning), they’re working. Never clean the centre or let it dry – that’s where all your good bacteria live. You can fit a large volume of media in the grey media baskets. A handy trick to getting the most out of them with Biomax, is to line up the pellets end-to-end in each side of the basket. Then you’ll want to wet or spray them with some water – let them freeze over in the freezer. You can now use the maximum amount of space – without spilling them everywhere. Because of the trays, cleaning is very easy. You only have to slide them out and give them a quick rinse. And you’ll know when to clean it because the water will start to pour out the middle, not the water spouts. Rarely do I get so excited by a HOB filter, but this feature rich one’s an attention grabber. There’s a lot to discuss. 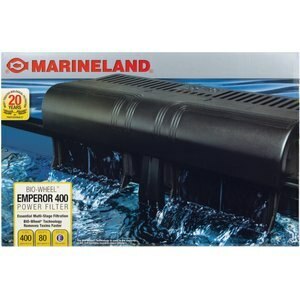 Suitable for both fresh and saltwater aquariums it’s available for 55, 75, and 100 gallon tanks. It’s made with a SICCE pump, which is an Italian company known for making quality pumps. It’s very powerful, and what’s super cool is that it’s placed below the water line. You never have to prime it. It features a telescopic intake so you can adjust the length, and there’s a blue dial that allows you to cover up the intake. Because the filter comes with a surface skimmer! I’ve never seen one on a HOB before. Anyway, the blue dial allows you to adjust how much water goes through the intake vs. the skimmer. So if you need more surface skimming you can adjust the dial and visa versa. There’s even a clip on this filter for your heater. You don’t have to worry about annoying suction pads that always lose suction. You can adjust the flow rate to account for delicate fish and plants who don’t like a strong flow. You get a large media basket, and the lid transforms into a tray for it! So you can carry or leave it on the side without making a mess. The lid also uses vents to prevent condensation. It’s a good lid. Am overflow chamber avoids water back up, and it uses a blue floater valve to tell you when it’s time to clean. There’s another dial on the back which moves your filter closer or further away from your glass to get a snug fit. It’s even got a rubber ring, so it won’t damage your aquarium. 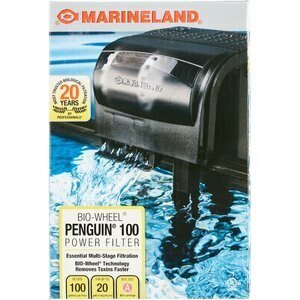 Overall, the filter runs quietly and does an outstanding job at keeping a healthy clean environment in your aquarium. Blue floater valve to tell you when it’s time to clean. Summary: The first ever filter made by Seachem–it’s definitely one to shout about. It’s been design from the ground up to provide your aquarium with high-quality filtration. I think you know which is my top pick. The Seachem Tidal Power Filter. Personaly, looking at all of them on the list, they’d all do a good job. Especially the AquaClear. 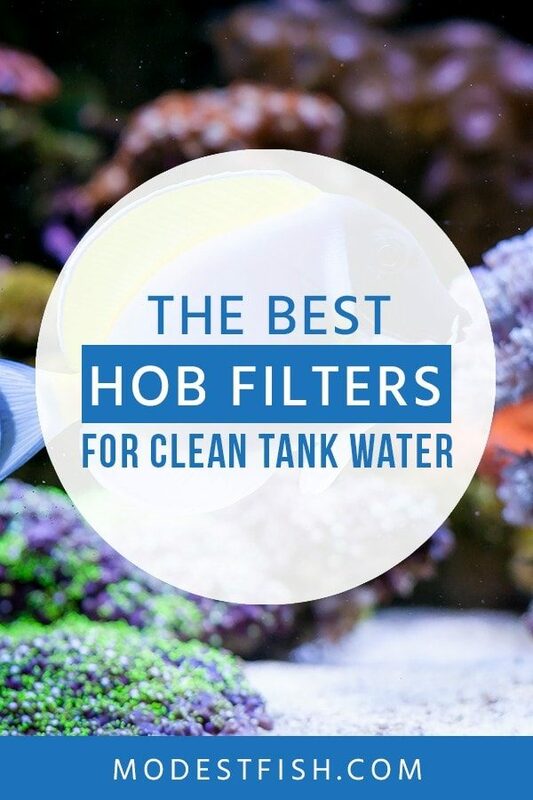 But, Seachem’s HOB filter packs the most value for its price in my opinion. The first ever filter made by Seachem–it’s definitely one to shout about. It's been design from the ground up to provide your aquarium with high-quality filtration.